My selfie-stick had come apart, and so we got directed to a warren of little shops that did everything electronic. They managed to re-solder it, and then mend my Mac charger, and sell us a 4-pin plug converter, all for 170 Rupees (£1.70), and refused to take more. The picture is an unposed test of the stick. 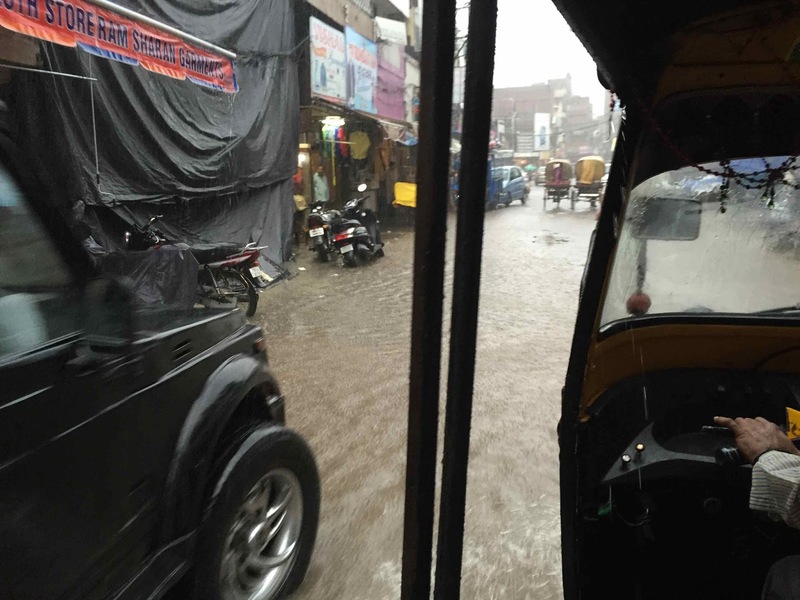 But then the rain came down - real monsoon style, and the streets filled up. Traffic was a shambles, and in the end our auto-rickshaw driver just gave up, and passed us over to a cycle-rickshaw. We had been reluctant to take the cycle-rickshaws as they seemed to much like something out of the Raj, but they were the only practical way to get through the streets. We were fine, but people were stuck pushing their conked-out motorbikes through a foot of water. The streets were full of potholes which became invisible, and even open drains - locals put little red flags up as warnings. I thought immediately of classic Laurel and Hardy scenes of walking through a puddle and disappearing, but it isn't so funny in real life - apparently people regularly just drop into the sewers as they are walking along. 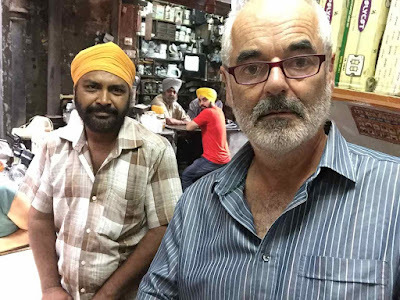 In the evening we set out to eat at the 'Brothers Dhaba' - an Amritsar institution (a dhaba is midway between a cafe and restaurant, like a snack-bar, and Punjabi dhabas are famous - we saw them all over Kashmir and Dharamsala). 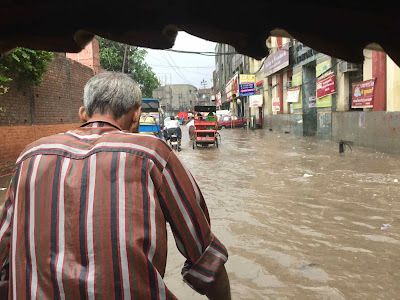 We had to take a cycle-rickshaw through the pitch-black flooded streets, it would have been lethal to try and walk. And outside the Brothers Dhaba they even had a makeshift jetty so that customers could get in without wading. We sat inside by the window, watching people struggle to get home. Apparently these floods are a regular occurrence, the drains having been blocked by shabby road mending. We were quite generous to the rickshaw-wallah, and after a good dinner we came out to find that he had waited the whole time to take us back to the hotel. So we stepped daintily along the jetty and got home quite dry, feeling like the Sahib and Memsahib.